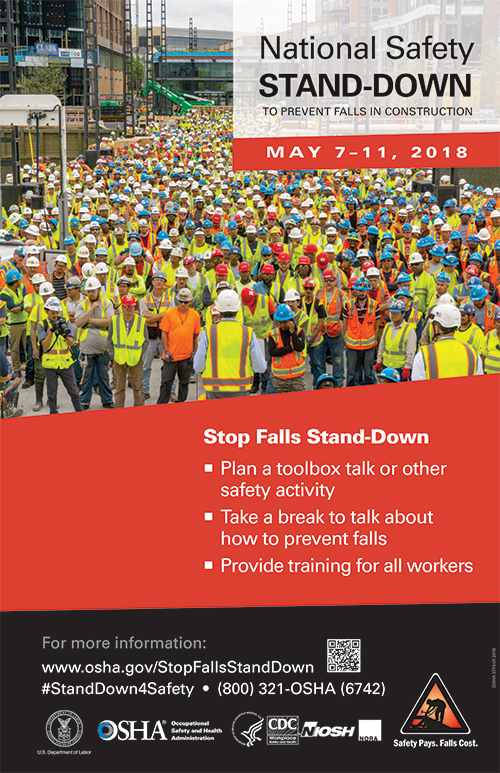 The U.S. Department of Labor’s Occupational Safety and Health Administration (OSHA) is holding its 5th Annual National Safety Stand-Down to Prevent Falls this week, beginning today, May 7th. The event encourages companies and workers to pause during the workday for topical discussions, safety demonstrations, and training in hazard recognition and fall prevention. In observance of 2018 National Safety Stand-Down week, USI branches across the country will recognize the safety stand-down by planning specific toolbox talks or other safety activities to address the issue of falls, taking breaks to talk about how to prevent them, and providing training for all workers. The lack of proper fall protection is the most frequently cited OSHA violation. Stand-downs provide employers and workers the opportunity to talk about hazards, protective methods, and the company’s safety policies, goals, and expectations. For more information on National Safety Stand-Down or to learn more about preventing falls in constructions, visit https://www.osha.gov/StopFallsStandDown/.